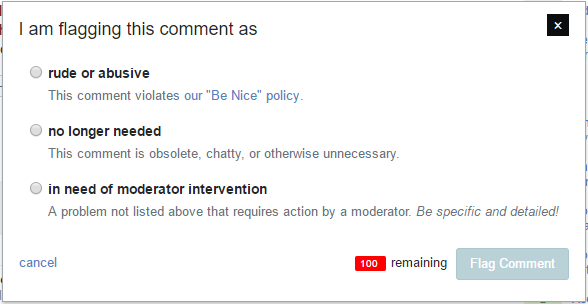 This isn't just terminology; when presented with the new reasons the first time, it really brought me up short that my only apparent options were (effectively) "abusive", "obsolete", or "moderator." Yes, further reading of the (handy) descriptions helps, but "longer" serves no purpose and does hamper comprehension. So simply "not needed" is all we need (though I'd prefer "not useful"). The literal meaning of "not constructive" would've been something like "useless", and "useless" / "not useful" / "unneeded" / "unnecessary" / "superfluous" were all proposed at one point as replacements. The first class of problem is high-priority - they're the sorts of comments that immediately make a site an unpleasant place to be even when not directed at the reader, so removing them quickly has a large immediate benefit. The second class of problem is... "Death by a thousand cuts" - one or two have an imperceptible cost, but in quantity they push the site closer to those tedious forums where finding useful information involves scanning past scores of irrelevant responses. Arguably we could just hide them and be done with it, except that no one can agree on a suitable threshold for doing it - so instead we have flags and rely on moderator judgement. Things that were once useful (obsolete). Things that were strictly-speaking always unnecessary, but in practice are demanded by social conventions (too chatty). I posted some statistics for these flags as they're used on Stack Overflow in 2016. You'll note that these latter three flags make up the vast majority of comment flags raised, and are almost universally helpful with the exception of "not constructive" which saw a bit over 6% declined. On that last observation... A big problem was that a common interpretation of "not constructive" wasn't just "useless", it was "slightly destructive" - IOW, folks often used it for comments they felt were rude or mean, as well as for comments that were off-topic, etc. Even though in theory it was the catch-all for "useless", in practice it was also the catch-all for "rude"! There was probably too much mental energy put into deciding between "rude" and "not constructive", with the end result of off-putting stuff just not getting flagged at all. Folks tended to be more upset if their flag got declined than they would've if the comment was just "noisy". Trying to automatically prioritize or handle comment flags based on type was prone to inaccuracy. This made revamping comment flags difficult, as there's a very good chance a lot of folks are going to just look for a drop-in replacement for whatever they'd previously been using. No problem if the flag they're looking to replace was "too chatty" or even "obsolete", but if it turns out we've settled on a new flag that looks too much like "not constructive" then we're gonna be back in the same boat - folks are gonna use it for off-putting stuff. After... Oh, a year or so of trying to come up with a wording that had the connotation of "useless but benign", someone suggested that the real line here was between things that a reasonable person - even someone completely unfamiliar with how these sites work - would recognize as inappropriate and those that might be posted in good faith but later seen (by the commentor or others) as unneeded. The hope here is that this name is immediately incongruous to flaggers looking for the "destructive" flag, while still close enough to "useless" (particularly with the subtext) to serve that purpose. I guess we'll see how that pans out in practice. Not the answer you're looking for? Browse other questions tagged feature-request comment-flags . “Not constructive” => “Rude or abusive” or “No longer needed”?